In August here in AZ any rational quiltmaker would be sitting at her sewing machine piecing a quilt in air conditioned comfort but this horse riding has turned me into a crazy person - out in the 110 degree temperatures . . . but having soooo much fun! Giddy Up! 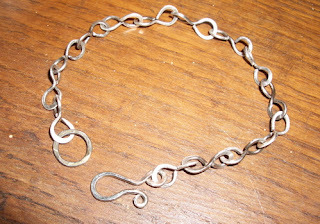 I made this little "easy link" bracelet a few days ago while I was contemplating my new pattern designs. It is ready to add some charms - some more jewelry play . . . perhaps I am my own worst enemy - venturing off to play with every possible distraction! 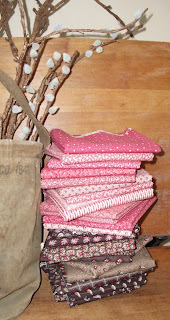 Fall Quilt Market is only 8 1/2 weeks away and even though there IS a plan - actual progress is less than a snail's pace! It has been sooooo hot here lately that an afternoon siesta is quite inviting though I have resisted MOST of the time. 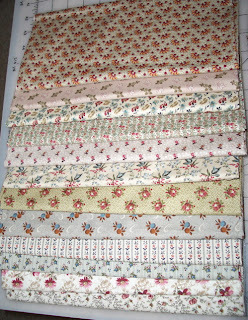 Hoping to post a little peek at some blocks soon for one of the two new quilts. 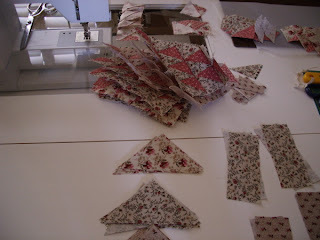 The strips are cut and ready for the EZ Angle ruler to slice them into half square triangles - ready, set, SEW!
. 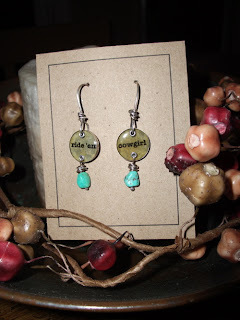 . . and these earrings (Nina style) are a little birthday gift I made for my friend, Joan . . . she is quite the cowgirl - even team ropes - she is a heeler for those of you in the know. Very impressive I think since just getting on and staying on the horse is enough of a challenge for me. My brother, his wife and three daughters stopped for a quick visit on their way from CA back home to OH. 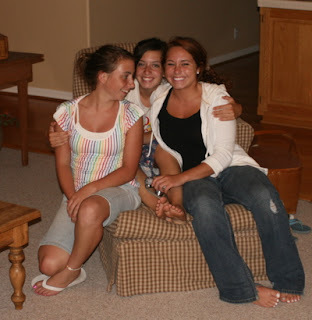 This is a picture of those cute girls - such nice young ladies as well! It was good to see them all even though it was very brief. An update on my recent health issues . . . close your eyes or change bloglines if perhaps this is TOO much information - . . . it seems that my new diagnosis and treatment is in direct conflict to the previous overzealous one. Thankfully my volatile blood pressure (a blessing in disguise) put brakes on the impending surgery and with further investigation (a second opinion) it appears that I only need a minor little procedure. THANK YOU TAMMY for your VERY wise thoughts. Is this the sweetest house? 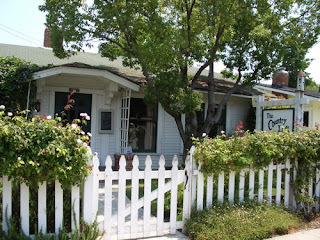 It is the home of The Country Loft in La Mesa, CA - if you love primitives, antiques and plaids then you won't want to miss visiting this shop. All of the darling girls who make this shop special will welcome you and make you feel right at home. There is a new photo album of my visit this weekend on the sidebar. Thank you to Kathy for being such a wonderful hostess - her home is sooooooo wonderful & she is a DOLL! Sweet JoAnn, the other shop manager (and Kathy's sister), went on a camping trip with her husband and grandchildren so I missed visiting with her. Sharon, the shop owner-antique buyer extraordinaire, and Kathy kept everything in order including me for another fun workshop weekend. I drove over on Friday and made it in record time - that even included a quick stop and visit with an Arizona Highway Patrol Officer to let me know I was going a "little bit too fast" - he was kind enough to give me a "warning" rather than a ticket. Three cheers for Officer Holstman - the rest of the trip I used the cruise control to ward off any additional unscheduled stops. Singing along with some new tunes from Taylor Swift, Carrie Underwood and Sara Evans made the road trip fly by. Back home again and ready to get started on Fall pattern projects - maybe I can be a "little bit too fast" on that! What a GRAND idea! This is a Flickr badge showing public photos from reneelibertystar. Make your own badge here.